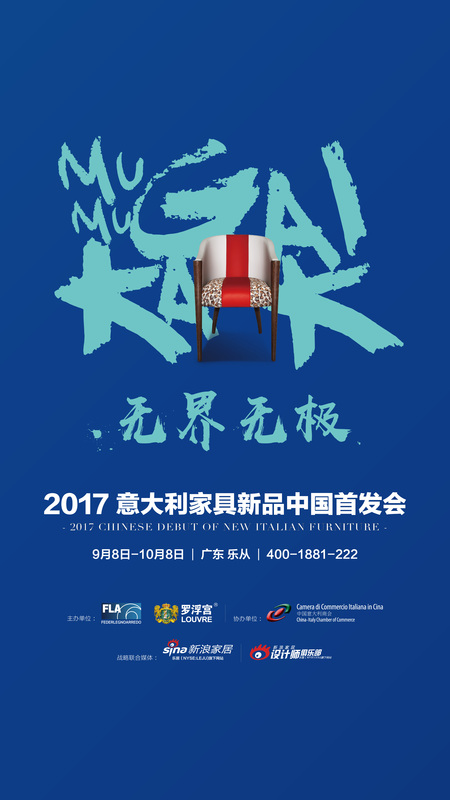 “Mu Gai Mu kak丨2017 Chinese Debut of New Italian Furniture” will be launched in Louvre International Furniture Exhibition Center, Guangdong, on September 8th. 800 pieces of new products of Milan furniture will gather for the first release! The event is jointly hosted by FLA, the official organization of the Salone del Mobile Milano and the Louvre Group, and co-organized by CICC, with Sina Home and LEJU Designer Club serving as the strategic cooperation media. Italian furniture is a symbol of trend and fashion, and the Salone del Mobile Milano held in April every year is the top event of the internationally recognized best furniture and the interior design industry, and a pilgrimage site of elites in the global design industry. This time FLA and the Louvre will join hands to bring the Chinese debut of the new products of various famous brands that were exhibited in the Salone del Mobile Milano this April. The amazing collection of 800 new products from a large number of top home furnishing brands in Italy,such as Fendi, Bentley, Versace, Giorgetti, Armani, Turri, Cornelio Cappellini,Roberto Cavalli, Visionnaire, Baxter, Jumbo, and Riva, will be interpreted with the Oriental language and bring new baptism of fashion! Showing the Chinese audience the new fine Italian furniture, the 2017 Chinese Debut of New Italian Furniture will fully display the art design and quality of life in Italy through a series of high-end activities. According to the Louvre Group(Friend of CICC), host of the event, on the first day of the debut, the Group will join hands with the international TOP resources to establish the international top-level overall home customization center, banding with international top furniture brands, and the overall indoor hard and soft decorating design, construction services, to provide Chinese high-end people with high-end home customization. During the event, a CEO signing session will also be held, and chief designers will provide overall high-end home customization services. In addition, the international first-class design masters will be present in the event, where with 21 minutes of “sharing of the soul” of each and the discussion about the most popular topics on architecture and design, they will bring the most wonderful ideological tide! The number of the attendance on September 8th, the launching day, is limited open for 100 seats only. Any intended audience can click “HERE” below and completely fill in the personal information. After the appointment is made, the applicant will be contacted by special responsible personnel and receive a paper invitation letter for the event admission on September 8th. Please note that the deadline for registration is at 18:00 of August 31st.